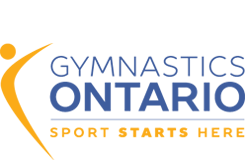 Power Tumbling blends the most exciting aspects of an Artistic Gymnastics floor exercise with the dynamics of Trampoline skills. Tumblers perform on a specialized tumbling strip, which is 26 metres long and 1.5 metres wide. The strip is an elevated floor sprung with horizontal fibreglass rods concealed beneath a carpeted layer of foam. The innovation of this specialized ‘floor’ has raised the level of the sport to new heights. It provides the athletes with an extremely explosive ‘launching pad’, which can propel the most talented athletes high into the air allowing them to perform combinations of consecutive aerial skills at levels of difficulty not normally seen in Artistic Gymnastics. 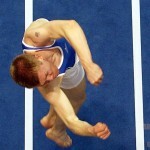 In competition the athletes perform tumbling lines (connected tumbling skills) called ‘passes’. These passes consist of eight acrobatic elements judged on their degree of difficulty and execution – which includes the evaluation of speed, technique, height and maintenance of tempo throughout the entire 8 element pass. Competitions are thrilling displays of dare devil feats, which defy gravity. The intensity builds, as the athlete stands alone at the end of the 11 meter long runway. With an explosive burst of power the athlete initiates their running approach with full effort toward the beginning of the tumbling strip. In a blink of an eye the athlete performs 8 dynamic elements, which are connected at the speed of light. The only thing to move faster than the tumbler is the rate at which this sport is evolving! In fact, the world’s best tumblers are now performing triple twisting double saltos, full twisting triple backs and some are even performing double backs in the middle of the pass proceeding through to a triple back pike dismount! The incredible pace and intricate high flying manoeuvres make Tumbling one of the most enjoyable disciplines to experience!